After taking Liz Steel’s, Sketching Now Watercolor course, I felt inspired to simplify my watercolor palette and create a master palette with only 24 colors. I know it’s tempting to buy every color of the rainbow when you first start painting (yes, I did this too), but if I could go back and have someone advise me NOT to do this, not only would I have saved a lot of money, but I would’ve saved a lot of wasted time and energy too. So in an effort to provide you with some extra guidance, here are some questions that might help you narrow down your color choices for a master palette. 1. Do I like this color as a stand-alone color? The very first thing I ask myself is this: is this a color that I like on its own? I know it sounds strange that you would have a color that you don’t even like in your own palette, but this is something that I struggled with a lot. I see a lot of beginners go out and buy a whole list of paints just because they are recommended by their favorite artist. I definitely fell victim to this when I first started painting. Two perfect examples of this for me would be the colors Opera Rose and Phthalo Blue. Both of these colors are beloved by many artists, and of course, for good reason. They’re beautiful, vibrant, and bold - and they make some really lovely mixes. It was clear though that they were not a good match for me from the beginning. I didn’t like them as stand-alone colors and rarely reached for them when I painted. But because many of my favorite artists had these in their palette, I continued to keep them in mine as well. Last year, I finally decided to get take them out, and I’ve been much happier with my palette since. Do you currently have some colors in your palette that you feel similarly about? Colors that you don’t even like just sitting in your palette unused? Maybe it’s time to let them go and clear up space for a different color that suits you better. 2. Is this a color that is practical for my style of painting? Whether it’s landscapes, abstracts, portraits, or botanicals - every person has a personal style and preference in the things that they paint and the way that they paint them. I do a lot of botanical paintings, so it makes sense for me to have several different greens in my palette. However, for someone who mainly paints portraits for example, this wouldn’t be as practical. Think carefully about the subject matter and style that you paint in, and ask yourself whether or not the color you’re considering makes sense for you. Just because you think a color is pretty doesn’t necessarily mean it’s a good choice for your palette. 3. Does this color mix well with the other colors in my palette? Not only should you like the color you’re choosing and know that it’ll be well-used, but a paint becomes even more valuable if it creates beautiful mixes with the other colors in your palette. This will help you gauge whether or not you should keep a certain color or possibly switch it out for a better alternative for mixing. For example, I’ve had Goethite in my palette since as long as I can remember. I really liked the color as a stand-alone and I used it often when I painted. But as I painted with it more, I started to realize that I didn’t like how it mixed with the other colors in my palette. That’s when I started to look for an alternative and found Monte Amiata Natural Sienna. After doing a side by side comparison of how both of them mixed, it was clear to me that I preferred the mixes that Natural Sienna created. I decided to switch them out last year and I’ve been so happy with that decision. I know it can be time consuming, but I would highly recommend doing some mixing charts if you’re unhappy with how a color is mixing or if you’re having trouble choosing between similar hues. 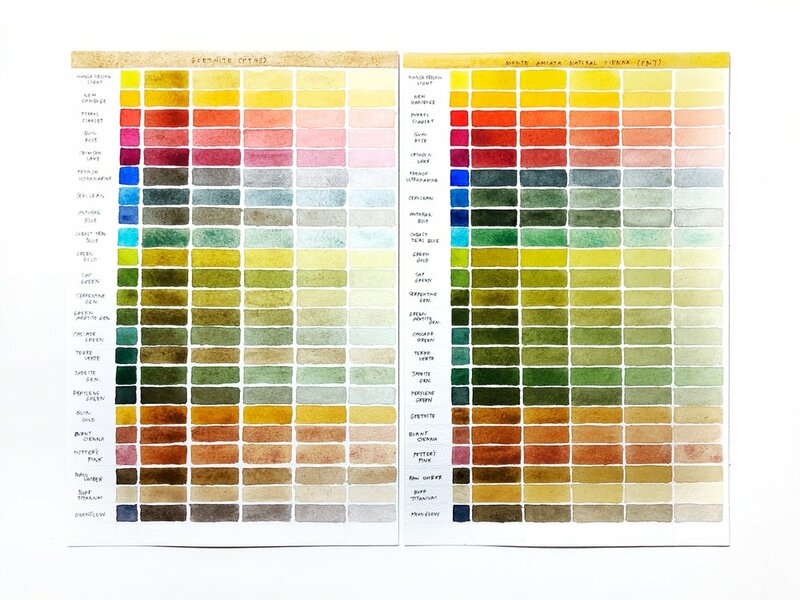 If you’d like to learn more about creating your own color mixing chart, check out this blog post on rae+lily. 4. Is this a color that I can mix on my own? If your answer is no and it passed all three previous tests, then this color might be a great fit for your master palette! If you answered yes, then you should ask yourself whether or not you use this color enough to want to add it to your palette as a convenience color. For example, if you saw my previous blog post listing the 24 colors in my current master palette, you’ll notice that I don’t have any purple/violet paints in it. I previously did, but quickly realized that I was able to mix my own purples with the existing yellows and blues in my palette. I also realized that I didn’t use purples or violets enough to justify having one in my palette. Sap Green, on the other hand (a color that I can easily mix on my own) is a color that I would never take out of my palette because it’s a staple in most of my paintings. Consider how easily you can mix a color and how often you will use it. This can help you decide whether or not you should keep it in your master palette. In the end, it’s really up to you to decide how many colors you want to invest in and what criteria you use to decide whether or not to add it to your palette. Some artists love to keep a basic palette of 12 or even 6 colors. Other artists have hundreds of colors and like to use them straight from the tube without ever having to mix colors at all. Again, it’s all personal preference. For me personally though, I love working with a limited palette because it encourages me to really get to know my paints and learn how to mix my own colors. It’s also super convenient for traveling. Let me leave you with some additional tips and resources as you think about what may work best for you. Purchasing dot cards or half pans of paint (when available) is a great way to experiment with colors and pigments before investing in a full tube. I also like to create my own dot cards and swap them with my watercoloring friends so we can try new paints without having to buy them. I’ll share more about how to make these in a future post! Jan Hart recommends that you keep a separate palette just for test pigments and only transfer a pigment into your personal palette when it has proved to be indispensable. I think this is a great tip! handprint.com: Handprint is a great resource if you’re hoping to nerd out about pigments and color theory. I also love using their artist’s color wheel as a reference when thinking about colors and color mixing. Jane Blundell: Jane shares some great information regarding her master palette and has a huge library of watercolor swatches that I often refer to. Liz Steel: Liz shares about her own master palette and how it continues to evolve as she paints. Check out her blog for some wonderful and interesting insight. Parka Blogs: Parka Blogs is a great resource if you’re looking for reviews of watercolor paints and sets. Enjoy!